Beloved Guardian of Love and Justice Returns In Special Two Weekend-Only Engagement in More Than 590 Movie Theaters Across The U.S.
VIZ Media, LLC (VIZ Media), a premier company in the fields of publishing, animation distribution, and global entertainment licensing, will partner with leading event cinema distributor, Fathom Events, to present a special series of SAILOR MOON limited engagements set for July and August at more than 590 movie theaters across the United States. A comprehensive list of all participating theatre locations and advance ticket sales are available now for all screening dates at https://www.fathomevents.com/collections/sailor-moon. Sailor Moon, the beloved Guardian of Love and Justice, returns to the big screen for a special theatrical event! Following an encore presentation of the first movie SAILOR MOON R: THE MOVIE, the Sailor Guardians unite once more to battle their chilliest adversary yet in SAILOR MOON S: THE MOVIE. The second week of showings will feature the classic anime's third movie SAILOR MOON SUPERS: THE MOVIE along with never-before seen in theaters short, "Ami's First Love." 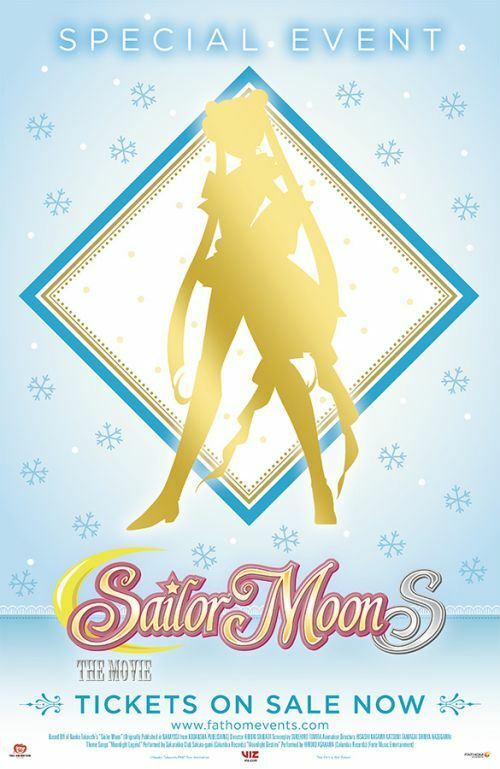 A limited edition SAILOR MOON full-color poster will be given to ticket holders at the screenings while supplies last. All features are presented uncut and true to the original Japanese version, with English dubbed and subtitled showings available. Catch the trailer at https://youtu.be/DXWaZudCdtc.